This is a portfolio of Graphic and Web Designs by Jessica Hollowell. All the items were created at the Venice Skills Center in Los Angeles, California. Work includes projects using the Adobe CS4 Suite, including Photoshop, InDesign, Illustrator, Dreamweaver and Fireworks. Paper and Book Arts originals and class schedule, visit my blog. 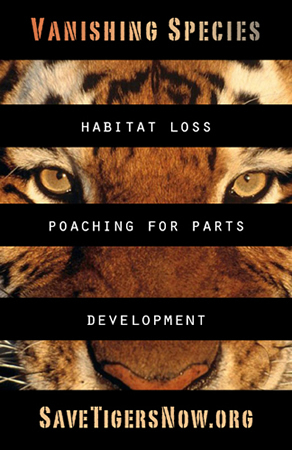 The image at right is a Non-Profit Poster for Save Tigers Now, made entirely in InDesign.